The American College of Surgeons do not recognize hair transplantation or hair transplants as a specialty. Because of this, All Doctors Are Not Equal In This Field. We also believe for your safety and best results, your hair transplant should be performed at a FULLY ACCREDITED SURGERY CENTER instead of a doctors office. If you are looking for the most Advanced Technology performed in an ADVANCED ACCREDITED SURGERY CENTER, under the direction of one of the Top Aesthetic Doctors In The World, look no further than Dr. Jon Mendelsohn if you are considering hair transplants. Dr. Mendelsohn is proud to be board-certified by both the American Academy of Facial Plastic and Reconstructive Surgery and the American Academy of Otolaryngology. Discover how the experience, skill, and sensitivity of Dr. Mendelsohn combine to help empower patients and enhance their lives. What separates Dr. Mendelsohn from many other professionals is his ability to capture the natural aesthetic potential of the individual patient, based on each patient’s personal aesthetic goals. His surgical artistry, combined with advanced techniques and a caring touch, has set the standard for excellence in hair loss prevention, hair regrowth and non-surgical aesthetic procedures. Dr. Mendelsohn has a special interest in combining laser treatments and hair transplants together which will help stabilize the hair during the healing process. and uses them extensively to treat individual areas of concern. Dr. Mendelsohn and his team specializes in all microscopic follicular unit extraction (FUE) and follicular unit grafting (FUG), with special expertise in the repair of prior hair transplants, restoration procedures in men and women, eyebrow and facial hair transplants, and larger procedures where as many as 3,500 or more hair grafts can be transplanted. Given his extensive training in facial plastic surgery, he is unique in the hair transplantation field with his aesthetic background, and is able to offer combined facial plastic surgery and hair restoration procedures for those patients seeking a more youthful appearance. Regularly featured by the media for his expertise in the treatment of hair loss and hair transplants, Dr. Mendelsohn is also considered a “doctor’s doctor”, with a number of his patients coming from the medical field. Furthermore, he receives consultation referrals from many plastic surgery colleagues. Patients from all over the United States have travelled to Dr. Mendelsohn for their cosmetic surgery procedures. In addition to performing hair transplantation using both the FUE and FUG techniques, he also is sought out for the repair of prior transplants on patients who have had outdated or unaesthetic procedures performed. 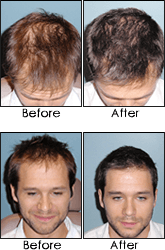 While many of his patients are men, Dr. Mendelsohn is also a expert in the treatment of hair loss in women as well.